This listing includes only works currently available or soon to become so. I have a number of long-term projects that I might add at some point. The most 'mature' of the is an SF novel I have been writing since September 1996. Titled 'In Dying Days', it has gone through several incarnations and may someday lurch once more into life. Nightfall in Avalon is a science-fiction adventure set in my 'Far Avalon' universe. Tal Peters is a con-man and a wild-talent telepath; his companion Jandro Dalden is a part-time barfighter. On the run from their last misadventure, they board the last ship to Far Avalon. Unable to stay out of trouble for long, Tal and Jandro make powerful enemies on both sides as civil war breaks out for control of First Landing Spaceport. With civilisation on the brink of collapse and chaos all around, Tal and Jandro find they hold the fate of Far Avalon in their larcenous, terrified fists. SOTS follows the first cruise of the Solomani Confederation patrol frigate Stormshadow and her new capain, Acting Lieutenant-Commander Simon Crowe. Crowe has spent the past eight years in the reserve, awaiting the outcome of an inquiry and court-martial. Suddenly reinstated and given the humdrum assignment of working up a new ship for trials, he finds that his Political Officer is an old comrade with whom he shares a chequered past and his crew are not up to the task at hand. Shortage of patrol vessels forces the Admiralty to send Stormshadow out before she is ready, hurling Crowe and his third-rate crew into the middle of a revolution. Betrayed and ambushed, Stormshadow must fight for survival against heavy odds, but victory only takes Crowe deeper into a maze of treachery and deceit. The conspirators have stacked the deck in their favour, but as they launch their revolution Stormshadow is still in the fight. Commander Crowe is the wild card that might change the game... but can one damaged and malfunctioning frigate be enough to prevent the collapse of the Confederation? When heroes fall and armies are routed, the fate of Kerinstye rests on the cornered-rat desperation of a band of swordslingers, retribution men and backstreet wizards. The womanising, larcenous enchanter Talsin and his psychotic sidekick Dalden are up against a horde of savages, a plague of monsters and a soul-drinking god. It’s a suicide mission, but that’s not the worst of their problems…. Driving a wedge between jealous king Yantr and his able First Advisor Duke Riall, ambitious Baron Terrik destabilises the kingdom of Valdir, hoping to regain his grandfather’s lost throne. Instead he leaves the kingdom open to invasion, forcing exiled Duke Riall to march homeward with his army. Riall must choose between entering Valdir as conqueror or liberator. Either choice forces him to confront his own birthright and to reveal truths long hidden. Cut off from the Home Worlds, the Bora Rina Colonial District is riven by civil war. As the Newly-created Grand Republic tightens its totalitarian grasp over the region, rebel worlds and warships fight for their independence. Pirates, patriotic traitors and a broken hero find themselves aligned against the might of the Grand Republican fleet. It is 1796, and the young General Bonaparte leads the armies of France on his career-making Italian Campaign. Among them is Victor Hevry, a young officer trying to keep ahead of a court-martial that will send him to the guillotine. His only chance is to find the man responsible for the fiasco that wiped out Victor’s unit, and somehow bring him to justice. Victor is pitted against the rampant corruption of the French army, an enemy who is a powerful superior officer, and the dangers of the campaign. From the fortress assaults at Mantua to the bloody slugging-match at Rivoli, Victor fights battles of his own amid Bonaparte’s masterpiece. Faced with invasion, the fledgling Republic of Torgin seeks to level the odds by retrieving a superweapon left over from an ancient war. This weapon, Skyfire, lies in the heart of a devastated continent warped by the magics of that war. For such a mission, the Republican government needs someone resourceful yet expendable. They find such a man in disgraced cavalry officer and former hero Jervon Dessartes. As Dessartes plunges into the unknown, his brother Andre is fighting in the front line as the Torgin army is worn down by musket and saber. Magical weapons are arrayed on both sides, but in the end the outcome will not be decided by devices, but by the actions of individuals. The ‘Standing’ series was written for Mongoose Publication, in the universe created for their Armageddon 2089 game. 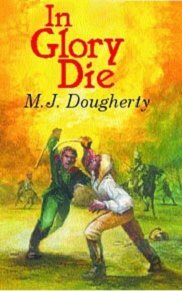 Betrayed and left for dead, cadet Mek Officer ‘Shotgun’ Mike Halsey returns to his native Britain and signs up with a forlorn-hope militia unit. Thrown into the desperate fighting on the Humber Line, the militia force is pitted against the hotshot EuroForce general Jean Lavalle and his subtle machinations. Lavalle hopes to break the Humber Line and roll up the Free British defences in one rapid offensive before the US can send reinforcements. He has the forces and the plan, but he has not reckoned on the desperate resolve of the British people. Nor is he ready to confront the fighting rage of a man who has lost everything. After the failure of his masterstroke, General Lavalle is in eclipse. US naval forces are headed towards Britain bringing vital supplies and troops to join the fight for independence and survival. As the European and American fleets clash in the Atlantic, the US government asks for a sign from the British – something to show the voters back home that the intervention can be a success. Free Britain needs a victory, so General Alexandra Rice leads the Free British Mek forces out in a desperate lunge at glory. In the spearhead is ‘Shotgun Mike’ Halsey and his Special Combat Group. But as the offensive founders and Halsey is cut off behind enemy lines, the situation looks bleak. As General Lavalle, launches an unauthorised offensive to regain his status, Halsey re-enters the fight. The fate of Free Britain is in the balance, but this time Halsey is not alone. As the Free British and their American allies begin to drive back the European invaders, a new threat emerges. The Nordic League is convinced that the US intends to make Britain effectively a new state of the Union, and will not tolerate the situation. Meanwhile the British government is tottering and looks set to be replaced with a pro-ceasefire administration. ‘Shotgun Mike’ Halsey sets out on a covert mission to find the missing Royal heir and rally the British people behind a ratified government. From the ruins of London to the corridors of Edinburgh Castle and the Parliament buildings in Manchester, Halsey must battle former friends as well as his enemies if Britain is to remain free.